Cochineal insect on a Opuntia cactus. A few weeks ago, Bug of the Week, found itself near the Mohave Desert in California. Many of the beautiful prickly pear cacti in the area were flocked with dense white wax. Beneath the wax small insects called cochineal insects sucked the sap from the succulent leaves of the cactus. These cochineal insects are close relatives of soft scale insects and aphids visited in previous episodes of Bug of the Week. The hallmark of aphids and soft scale insects is the production of a sweet sticky substance called honey dew. Unlike these suckers, cochineal insects produce vast quantities of white wax. 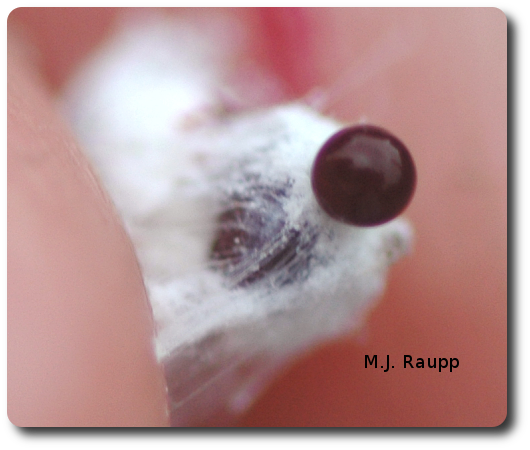 Female cochineal insects produce eggs under their waxy cloak. Eggs hatch into mobile nymphs called crawlers that disperse and colonize new fronds and plants. Nymphs settle down, produce their own wax, and eventually molt into egg-producing adults. The vivid red fluid is called cochineal red dye. Rebecca, one of our intrepid bug aficionados, plucked a large cochineal insect from an Opuntia cactus and gave it a squeeze. The hapless bug delivered a droplet of brilliant red body fluid as it burst between her fingers. Undoubtedly, this remarkable experiment was first conducted centuries ago in Mexico and Central America when natives of the new world squished cochineal insects for the very first time. The vivid red fluid is called cochineal red dye. For centuries Native Americans used cochineal to color textiles. Aztecs perfected the art of culturing cochineal insects to be used as a source of dye long before the arrival of Cortés in 1519. History has it that Cortés was so impressed by the magnificent hue of the cochineal dye that he took it back to Spain where it became popular in the textile industry. The discovery of cochineal spurred the development of a thriving farming industry to culture cochineal insects and produce red dye. In addition to its traditional use as a dye for fabric, cochineal continues to be used as a natural coloring agent for cosmetics and many kinds of food. But what was Mother Nature’s plan in giving the cochineal insect its brilliant red blood? Was this merely a scheme to dress up rather drab Homo sapiens? The vermillion color of the cochineal derives from an organic compound known as cariminic acid. The vermillion color of the cochineal derives from an organic compound known as cariminic acid. In a series of fascinating studies Tom Eisner and his colleagues and collaborators discovered the repellent qualities of this bitter pigment. Predators such as ants avoid this chemical. Clearly, cariminic acid evolved as a defensive compound to help the cochineal insect gain protection from animals that would like make it a meal. In an ironic twist of events, several predators of the cochineal insect have turned the table on the clever sucker. A bizarre species of predatory caterpillar, a species of predatory fly, and a species of lady bug have evolved to eat cochineal insects. Not only have they broken through the cariminic acid defense of the cochineal insect, but all three species now use the cariminic acid as a defensive compound that they vomit, secrete, or defecate when attacked by their own predators. In the case of the cochineal insect, nature is red in tooth and claw. We thank Rebeccah Waterworth for providing the inspiration for this Bug of the Week. The wonderful book "For Love of Insects" by Tom Eisner was used as a reference. For more information on cochineal insects and red dye, please visit the following web sites.